Opinion: The Fortitude Valley hasn’t always had an identity crisis. In its heyday of the 1950’s and 1960’s the area was actually Australia’s largest non-CBD shopping precinct. It was a shopping mecca. The three major local department stores McWhirters, Beirne’s and Overells fought to win over business from the area’s many shoppers. The intersection of Brunswick and Wickham Streets, Fortitude Valley in the 1950’s. The suburb had life, it had pedestrians and it was easily accessible via the tramway system. Fast forward to the 1970’s where the uprising of the suburban shopping centre and unstoppable popularity of the car fueled a quick downturn which eventually saw the departure of retail in the Fortitude Valley. Since the dark days of illegal casinos and brothels in the 1970’s and 1980’s the Valley has since been resurrected as Brisbane’s premier music and entertainment precinct. Unlike the unfortunate and recent demise of Sydney’s Kings Cross entertainment precinct, the Valley represents to this day one of Australia’s most successful night time economies. However the same cannot be said for the Valley’s day-time economy which is almost non-existent. For years the Brisbane City Council has been grappling with trying to enhance the area’s day time economy, and has made some small strides. 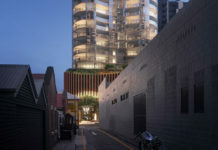 However there is an excruciatingly simple and affordable way of transforming the area into once again a bustling precinct – both day and night. In the 1970’s, when the car was king, Wickham and Ann Streets which run straight through Fortitude Valley were converted from two-way streets into one-way streets. Why? Well the aim was simple, getting cars moving faster and more directly, or so they thought. By doing so there was also a serious side effect to this conversion, and that was pedestrian life. Wickham and Ann streets are undeniably like mini four lane freeways which slice through the popular entertainment area. Arterial roads tend to have that effect. Recent media coverage of boarded-up shop fronts in the Fortitude Valley are a direct reaction of the absence of pedestrian street life. Would you ever think of sitting on the side of Wickham or Ann Streets having a coffee or talking with friends? never. Subconsciously we know that not only is it unsafe but undesirable to have trucks hurling next to you on the side of these streets. If you ever wanted a more simple and affordable way of giving back identity and pedestrian life for the Fortitude Valley, this is it. A mountain of global research has validated that two-way streets are undeniably better for pedestrian safety, walkability, property values, street-activation and neighbourhood rejuvenation. Why? because two-way streets create what is known as traffic calming, which discourages high-speed and volume through-traffic and encourages people orientated streets instead. Now if you’re thinking, YES! 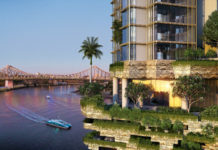 this will be Brisbane’s very own clever idea, sadly we have been beaten to the punch. The City of Perth has already begun converting some of their key one-way streets into two two-way streets. Better late than never, right? Oh but think of the traffic! Now for those of you who may be thinking this is a very bad idea, two way streets will certainly stuff up Brisbane’s traffic and make it even worse. Well, a recent report by SKM in 2010 titled ‘Two Way Road Network Paramics Model’ actually found that a two-way system reduced total distance travelled during both am (by 8%) and pm (by 16%) peak hour. A two way system decreases the average driving distance between origin and destination. Why? because a two-way system gives you more route choices and decreases unnecessary circling trips. Also, who wouldn’t want to drive through a vibrant, happening street instead of a desolate, depressing streetscape. The Valley is cool and fun right now, but imagine if the valley had it all. It would grow to become a national tourist destination in its own right. The City of Perth has produced some infographics to explain the benefits of two-way streets which can be seen below and on their website. The solution is simple. Convert Wickham, Ann and McLachlan Streets back to two-way traffic and reclaim one lane for additional footpath and bikeway space. Two lanes would continue to serve traffic in the direction the one-way traffic currently flows, and the introduction of one lane of traffic flowing the other direction. A before and after sketch shown below of the corner of Wickham and Brunswick Streets illustrates how the street currently looks like (a street designed for cars), and how a future two-way street could look like (a street designed for humans). Looks like a fantastic idea. A couple of questions, (1) has a traffic study been undertaken and (2) these avenues provide an important corridor to through traffic, what alternative routing is required to prevent the mother of all traffic congestion? (1) I don’t know but we can see the positive results of this done elsewhere. (2) This may actually make traffic flow better, but we also have the Clem & and ICB as viable alternatives. Also, the experience from similar projects is that people often find other routes or other modes, or don’t even take those trips anymore. The Clem 7 was designed to remove much of the through traffic from this area. The fact that it has a toll and Ann Street doesn’t explains why this hasn’t happened as much as it might. But definitely agree that with wider footpaths and lots more trees, this would go a long way to making The Valley a much more attractive area for people and day time business. In general, I agree with the proposal. The Valley certainly needs some improvement to address the balance between active, public and private transport. My concern regarding traffic is the about the way the couplet system links into the Ann/Turbot couplet through the City (and flowing back onto the Riverside Expressway). But that’s certainly something that can be examined and addressed. It may require greater use of St Pauls Terrace, which IMO is under-utiilised through the Valley. A key benefit is the triggering of significant revisions to the bus network (through the removal of the Ann Street Islands and relocating bus terminating locations), which are already needed, but BCC blocks any efforts to make substantive changes. At an absolute minimum, I would like to see 24hr bus lanes on both streets and a bus review to improve services. Totally agree re the footpath dining there. Can’t imagine why anyone one would want to do so at the moment. Also, imagine the amount of buses heading towards New Farm that would no longer have to do that dog leg via Warner Street. This is a great idea, and one that has been raised periodically over the last twenty years or so. However traffic engineering arguments about prioritizing vehicle movements seem to have constantly won the day. The study area takes in the area bounded by the river edge and the eastern edge of Ann Street but doesn’t include the area referred to in your article – maybe it should ? In other words it would appear to be another study by traffic engineers into how to move vehicles more expeditiously – not a study about how to make the public space of the street an environment which gives a fair go to both vehicles and people. Other great advantages of two-way streets are simplification of bus routes (allowing opposing stops in one street only, not a block away) and easier servicing (especially rubbish collection) of premises on both sides of the road. And why stop at the Valley? Brisbane CBD would also benefit from conversion of one-way streets to two-way, particularly Elizabeth and Edward. Totally agree re the CBD. Still far too many people drive through it – and the council doesn’t seem to care. Someone needs to fix the “After” picture. Put the same amount of cars and bus back into it and at the same size! I agree with the SKM finding for those driving to a destination within Fortitude Valley. However, turning a four lane one way road into two by two lane both ways does not help the majority of traffic that passes through Fortitude Valley in the peak hours, but simply transfers the congestion to either the CBD or Newstead. For this concept to work, it needs to ensure that traffic is not slowed or stopped. This means putting road crossing points either above the road or below it, preferable the former. Creating large over-traffic walkways that can be used for pedestrians and coffee shops etc. would revitalise the Valley and keep the traffic moving. This can work with a sub-tropical theme. Alternatively, build a tunnel to funnel passing-through traffic, but this is an expensive option. The tunnel for passing-through traffic finished construction in 2010 and goes by the name Clem7. Great idea and the kind of forward planning that the Valley really needs. The city council has been very reluctant to invest in improvements to the Valley despite the vast amounts of private development occurring at present and the terrible public realm. The Valley mall project was under-funded and badly mismanaged. The valley badly needs some green spaces, improved footpaths and decent (safe) bus stops. I get the feeling that this has less to do with improving the day time economy, and more about wanting to gentrify the Valley. I say leave the Valley as it is. During the day it’s a little dingy, a bit dodgy, but it’s somewhere interesting to. It’s not clean, it’s no shiny, and it’s not the same as everywhere in Brisbane, it has its own character, and its unique. Why would we want to loose that just to get some more kerbside cafes, office based businesses, and fashionable retail stores. I say leave the Valley as it is. A place for the creatives and the weirdos (that is a compliment). Parking, Parking, Parking. I don’t visit the Valley anymore as it is difficult to park and I come from the Moreton Bay Region and traveling in on public transport is a complete rip off for a family. The design of the cycling infrastructure needs a bit more thought in this visual if it’s going to be an effective provocation. With so many new apartments in this area, people could cycle into the city centre or to the amenities in the Valley, New Farm, and Newstead. It seems like there would be a great argument for separated bike lanes, and dedicated bus lanes.